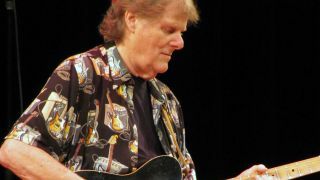 Session guitarist Reggie Young has died at the age of 82. He passed away last night at his home outside Nashville. Young enjoyed a seven-decade career, playing on records by artists as varied as Bob Dylan, Paul Simon, Joe Cocker, B.B. King, Sinead O’Connor, Elvis Presley, John Prine, J.J. Cale, Willie Nelson, Johnny Cash, Cat Stevens and more. Amongst his most famous contributions are guitar parts on Dusty Springfield’s Son of a Preacher Man, Presley's Suspicious Minds and In the Ghetto, and the iconic intro to Dobie Gray's Drift Away. Born in Caruthersville, Missouri, in 1936 and raised in Osceola, Arkansa, Young was a prodigy guitarist, and picked up work backing rockabilly singer Eddie Bond after the family moved to Memphis. After two years in the army he joined Bill Black's Combo, most famous as being the opening act on the Beatles first US tour. “I didn’t have a clue who they were until we got to San Francisco," says Young. "The first night we played the Cow Palace. I’d never heard that much screaming and carrying on. They had barricades so the kids wouldn’t jump up on the stage." Young later became an in-demand session musician in Nashville, playing on sides by Merle Haggard, Willie Nelson, Waylon Jennings, Hank Williams Jr., Kenny Rogers and Reba McEntire, and serving as leader of the house bands at Hi Records and American Studios. Last year Young released his first solo album, Forever Young, while Ace Records are releasing a box set of his work entitled Reggie Young: Session Guitar Star later this month. "Known for the famous guitar lick on Dobie Gray’s Drift Away - he also played on so many other artists records (Elvis, Waylon, Hank JR. to name a very few). Moreover, Reggie was a genuinely nice and humble human being. My deepest condolences to his family." The photo of Reggie Young is licensed under the Creative Commons Attribution 3.0 Unported license. Photo by Jeremylr68.